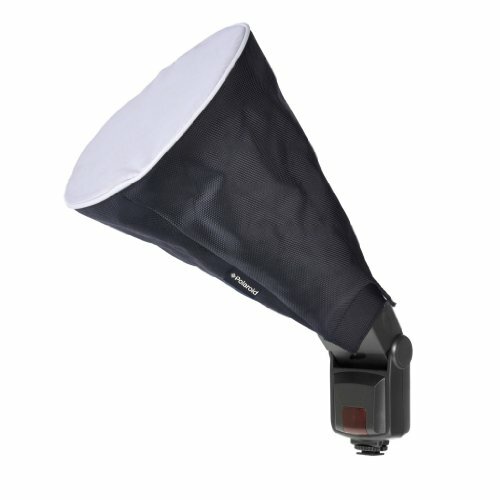 Polaroid Universal Collapsible Circular Cone (Trumpet) Studio Softbox For The Panasonic Lumix DMC-G3, DMC-GF3, DMC-G1, DMC-GH1, DMC-GH2, DMC-GH3, DMC-GH4, DMC-L10, DMC-GF1, DMC-GF2, DMC-G10, DMC-G2, DMC-GF3, DMC-G3, DMC-GF5, DMC-G5, DMC-GF6, DMC-G6, DMC-G by Polaroid at Kmpacting Studio. MPN: PLD-IFTP-6. Hurry! Limited time offer. Offer valid only while supplies last. Create beautifully softened light on the go. The Polaroid trumpet diffuser is lightweight and collapsible, a perfect combination for easy storage.